The Rainshower Classic 160 shower set is, with its soft curves, the ideal shower set for your modern bathroom. The set comes complete with a 900 mm shower rail and sturdy metal wall mounts, a hand shower and a 1750 mm long shower hose. The shower head is equipped with the handy Twist-Free application, which prevents the shower hose from getting tangled up. The set is a luxurious edition with up to four spray patterns to choose from ~ the Rain spray, and the Jet-, the Massage and the Pure Spray. However you feel on that specific day, you'll find your favourite spray in this shower. From relaxing to stimulating. 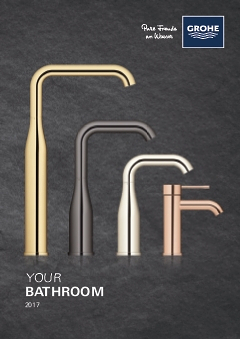 The set is made of shiny GROHE StarLight, the scratch-resistant coating and also features Inner WaterGuide, which keeps the hand shower cool enough to hold in your hands and ensures a longer life.